can be interpreted by saying that the left-hand side, the rate of change of slope, is the curvature – so the curvature of the function is proportional to ( V( x )−E )ψ( x ). This means that if E>V( x ), for ψ( x ) positive ψ( x ) is curving negatively, for ψ( x ) negative ψ( x ) is curving positively. In both cases, ψ( x ) is always curving towards the x -axis -- so, for E>V( x ), ψ( x ) has a kind of stability: its curvature is always bringing it back towards the axis, and so generating oscillations. The simplest example is that of a constant potential V( x )= V 0 <E, for which the wave function is ψ( x )=Asin( kx+δ ) with δ a constant and k= ( 2m/ ℏ 2 )( E− V 0 ) . For a constant potential V 0 >E, the wave function is ψ( x )=A e αx +B e −αx , with α= ( 2m/ ℏ 2 )( V 0 −E ) . Of course, this wave function will diverge in at least one direction! However, as we shall see below, there are situations with spatially varying potentials where this wave function is only relevant for positive x, and the coefficients A, B are functions of the energy -- for certain energies it turns out that A=0, and the wave function converges. In an earlier lecture, we considered in some detail the allowed wave functions and energies for a particle trapped in an infinitely deep square well, that is, between infinitely high walls a distance L apart. For that case, the potential between the walls is identically zero so the wave function has the form ψ( x )=Asin( kx+δ ). The wave function ψ( x ) necessarily goes to zero right at the walls, since it cannot have a discontinuity, and must be zero just inside the wall. Even a quantum particle cannot penetrate an infinite wall! An immediate consequence is that the lowest state cannot have zero energy, since k=0 gives a constant ψ( x ) . Rather, the lowest energy state must have the minimal amount of bending of the wave function necessary for it to be zero at both walls but nonzero in between -- this corresponds to half a period of a sine or cosine (depending on the choice of origin), these functions being the solutions of Schrödinger’s equation in the zero potential region between the walls. The allowed wave functions (eigenstates) found as the energy increases have successively 0, 1, 2, … zeros (nodes) in the well. Notice that the allowed wave eigenfunctions of the Hamiltonian for the infinite well are symmetrical or antisymmetrical about the center, ψ( x )=±ψ( −x ). We call the operator that reflects a function in the origin the parity operator P, so these eigenstates of the Hamiltonian are also eigenstates of the parity operator, with eigenvalues ±1. This is because the Hamiltonian is itself symmetric: d 2 /d x 2 is even in x, and so is V( x ), so [ H,P ]=0, and the two operators can be simultaneously diagonalized, that is, a common set of eigenstates can be constructed. If the potential at the walls is not infinite, the parity operator P will continue to commute with the Hamiltonian H as long as the potential is symmetric, V( x )=V( −x ) . V( x )= V 0 , x<−L/2, V( x )=0, −L/2≤x≤L/2, V( x )= V 0 , L/2<x. The numerical strategy is to pick a value for the energy E, choose one of the boundary conditions above and integrate ψ( x ) numerically to a large positive value of x. For almost all values of E, the wave function will be exponentially increasing with x. For the particular values corresponding to bound states, it will be exponentially decreasing. It is well worth while building up an intuition for this by playing with the spreadsheet accompanying this lecture: the spreadsheet does the numerical integration for any E and well depth, and has a macro to locate the nearest bound state. The numerical method mentioned above works for any symmetric potential. Fortunately, for the square well, an analytic/graphical method is very effective, and provides more insight. e αx and e −αx , where α= 2m( V 0 −E)/ ℏ 2 . We are assuming here that E< V 0 , so the particle is bound to the well. We shall find the lowest energy state is always bound in a finite square well, however weak the potential. Now, Schrödinger’s equation must be valid everywhere, including the point x=L/2 . Since the potential is finite, the wave function ψ( x ) and its first derivative must be continuous at x=L/2. Solving these equations for the coefficients A,B in the usual way, we find that in general the cosine solution inside the well goes smoothly into a linear combination of exponentially increasing and decreasing terms in the wall. However, this cannot in general represent a bound state in the well. The increasing solution increases without limit as x goes to infinity, so since the square of the wave function is proportional to the probability of finding the particle at any point, the particle is infinitely more likely to be found at infinity than anywhere else. It got away! This clearly makes no sense -- we’re trying to find wave functions for particles that stay in, or at least close to, the well. We are forced to conclude that the only exponential wave function that makes sense is the one for which A is exactly zero, so that there is only a decreasing wave in the wall. This equation cannot be solved analytically, but is easy to solve graphically by plotting the two sides as functions of k (recall α= 2m( V 0 −E)/ ℏ 2 , and k= 2mE/ ℏ 2 ) and finding where the curves intersect. k< 2m V 0 ℏ .
tan(kL/2)= α k = 2m V 0 ℏ 2 k 2 −1 . Cleaning up the appearance of the equation by choosing variables x= kL 2 , a 2 = m V 0 L 2 2 ℏ 2 , and plotting tanx and ( a x ) 2 −1 from x=0 to x=a, allowed bound state k -values correspond to the points of intersection of the two curves. The bound state energies are then given by E= ℏ 2 k 2 /2m. It is interesting to note that however small a is, the curve y= ( a x ) 2 −1 goes to infinity as x goes to zero, so will always intersect y=tanx : there will always be a bound state. For the lower energies at least, the allowed k – values are approximately linearly spaced, at about π/2, 3π/2, 5π/2,… so the bound state energies are not far off the 1, 9, 25,… pattern of the infinitely deep square well -- remembering that we are only looking at the even parity (cosine) solutions! Exercise: Use the spreadsheet with D = 50, W = 4 and find all the even bound state energies. How well do they fit this pattern? Can you account for the deviation? Examine the wave functions for the different eigenenergies: note how far it penetrates the wall, and how much that changes the boundary condition at the wall from that for an infinite wall. Which one of the bound state energies is most affected by this, and how is it affected? Would you expect that from the graphical solution? The odd parity solutions, sine waves inside the well, can be found by an exactly similar analysis. One difference is that an arbitrarily weak well will not bind an odd parity state. The point is that for a weak potential to bind an even state, it only has to curve the wave function slightly to get from one exponentially decaying to the left to one exponentially decaying to the right. These curves decay very slowly for a weak potential, and give a bound state in which the particle is most likely to be found outside the well. On the other hand, in an odd solution the wave function within the well has to have enough total curvature to fit together two decaying wave functions which have opposite sign. This takes much more bending, and cannot be achieved with a very weak potential. Exercise: Check this last statement, by considering what fraction of a wavelength of the oscillating wave function inside the well is necessary to make a connection between the decaying wave functions in the walls to the left and right. negative for an attractive potential. The infinity of the δ -function cannot be balanced by the finite right hand side, so the wave function must have a discontinuity in slope at the origin. 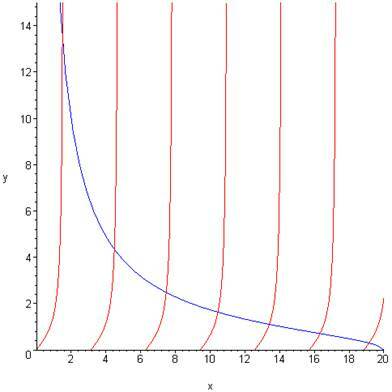 To find the ground state energy, note first that as a one-dimensional attractive potential there will be a bound state: any change in slope is sufficient to connect an exponentially increasing function coming in from −∞ to a decreasing one going to +∞, since the rates of increase and decrease can be arbitrarily slow. the energy of the state being E=− ℏ 2 α 2 /2m . dψ( x=+ε ) dx − dψ( x=−ε ) dx =−2Aα . ∫ −ε ε − ℏ 2 2m d 2 ψ(x) d x 2 dx + ∫ −ε ε λδ( x )ψ(x) dx= ∫ −ε ε Eψ(x)dx . going to zero. The δ -function term must integrate to λψ( 0 )=λA. ∫ −ε ε − ℏ 2 2m d 2 ψ(x) d x 2 dx =− ℏ 2 2m ∫ −ε ε d dx ( dψ dx )dx=− ℏ 2 2m [ dψ dx ] −ε ε = ℏ 2 2m 2Aα. (Remembering λ is negative for an attractive potential). E=− ℏ 2 α 2 2m =− m λ 2 2 ℏ 2 . Exercise: rederive this result by taking the limit of a narrow deep well, tending to a δ -function, with a cosine wave function inside. Our analysis so far has been limited to real-valued solutions of the time-independent Schrödinger equation. This is fine for analyzing bound states in a potential, or standing waves in general, but cannot be used, for example, to represent an electron traveling through space after being emitted by an electron gun, such as in an old fashioned TV tube. The reason is that a real-valued wave function ψ( x ) , in an energetically allowed region, is made up of terms locally like coskx and sinkx, multiplied in the full wave function by the time dependent phase factor e −iEt/ℏ , giving equal amplitudes of right moving waves e i(px−Et)/ℏ and left moving waves e −i(px+Et)/ℏ . So, for an electron definitely moving to the right, even the time-independent part of the wave function must necessarily be complex. where k 1 corresponds to the slower speed the particle will have after climbing the hill. Schrödinger’s equation requires that the wave function have no discontinuities and no kinks (discontinuities in slope) so the x<0 and x>0 wave functions must match smoothly at the origin. For them to have the same value, we see from above that A=B. For them to have the same slope we must have kA= k 1 B. Unfortunately, the only way to satisfy both these equations with our above wave functions is to take k= k 1 -- which means there is no step potential at all! Question: what is wrong with the above reasoning? ψ(x,t)=B e i k 1 x e −iEt/ℏ for x>0. A+C=B k( A−C )= k 1 B.
R= C 2 A 2 = ( k− k 1 k+ k 1 ) 2 . T=1−R= 4k k 1 ( k+ k 1 ) 2 . Question: isn’t the amount transmitted just given by B 2 / A 2 ? The answer is no. The ratio B 2 / A 2 gives the relative probability of finding a particle in some small region in the transmitted stream relative to that in the incoming stream, but the particles in the transmitted stream are moving more slowly, by a factor k 1 /k. That means that just comparing the densities of particles in the transmitted and incoming streams is not enough. 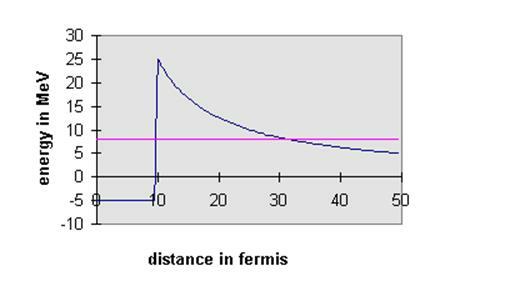 The physically significant quantity is the probability current flowing past a given point, and this is the product of the density and the speed. Therefore, the transmission coefficient is B 2 k 1 / A 2 k.
Exercise: prove that even a step down gives rise to some reflection. If a plane wave coming in from the left encounters a step at the origin of height V 0 >E, the incoming energy, there will be total reflection, but with an exponentially decaying wave penetrating some distance into the step. This, by the way, is a general wave phenomenon, not confined to quantum mechanics. If a light wave traveling through a piece of glass is totally internally at the surface, there will be an exponentially decaying electromagnetic field in the air outside the surface. If another piece of glass with a parallel (flat) surface is brought close, some light will “tunnel through” the air gap into the second piece of glass. We are considering here the quantum analogue of this classical behavior. V=0 for L<x, region III. In this situation, the wave function will still decay exponentially into the barrier (assuming the barrier is thick compared to the exponential decay length), but on reaching the far end at x=L, a plane wave solution is again allowed, so there is a nonzero probability of finding the particle beyond the barrier, moving with its original speed. This phenomenon is called tunneling, since in the classical (particle) picture the particle doesn’t have enough energy to get over the top of the barrier. ψ I ( x )= e ikx +B e −ikx . ψ II ( x )=C e αx +D e −αx . Recall α= ( 2m/ ℏ 2 )( V 0 −E ) . ψ III ( x )=S e ik( x−L ) . 2ik=(ik+α)C+(ik−α)D 2αC e αL =(ik+α)S 2αD e −αL =−(ik−α)S.
S(k)= 2kα 2kαcoshαL+i( α 2 − k 2 )sinhαL. |S(k) | 2 = 4 k 2 α 2 ( k 2 + α 2 ) 2 sinh 2 αL+4 k 2 α 2 . 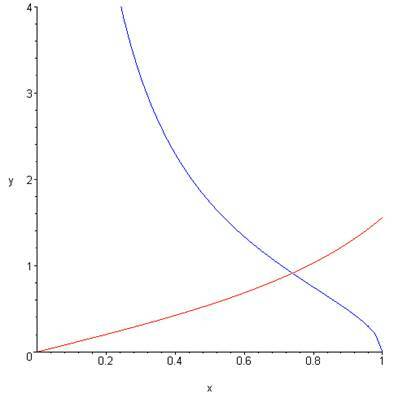 An important limit is that of a barrier thick compared with the decay length, αL≫1. | S( k ) | 2 ≅16( E V 0 )( 1− E V 0 ) e −2αL . In typical tunneling problems, the far and away dominant term is the e −2αL , which may differ from unity by many orders of magnitude. The methods developed above for the one-dimensional system are almost immediately applicable to a very important three-dimensional case: a particle in a spherically symmetric potential. A more detailed treatment will be given later -- we restrict ourselves here to spherically symmetric solutions of Schrödinger’s equation ψ( r,θ,ϕ )=ψ( r ) , a subspace of the space of all possible solutions that always includes the ground state. p → 2 2m =− ℏ 2 ∇ → 2 2m =− ℏ 2 2m 1 r 2 d dr ( r 2 d dr ). Exercise: for a spherical square well, V=0 if r< r 0 , V= V 0 for r≥ r 0 , find the minimum value of V 0 for which a bound state exists for given r 0 and particle mass m. Sketch the wave function. Therefore, an α -particle bouncing around inside the nucleus may have enough energy to tunnel through to the outside world. − ℏ 2 2m d 2 u( r ) d r 2 +V( r )u( r )=Eu( r ), r>0. It is evident that the more energetic the α -particle is, the thinner the barrier it faces. Since the wave function decays exponentially in the barrier, this can make a huge difference in tunneling rates. It is not difficult to find the energy with which the α -particle hits the nuclear wall, because this will be the same energy with which it escapes. Therefore, if we measure the energy of an emitted α , since we think we know the shape of the barrier pretty well, we should be able, at least numerically, to predict the tunneling rate. The only other thing we need to know is how many times per second α ’s bounce off the wall. The size of the nucleus is of order 10-14 meters (10 fermis), if we assume an α moves at, say, 107 meters per second, it will bang into the wall 1021 times per second. This is a bit handwaving, but all α -radioactive nuclei are pretty much the same size, so perhaps it’s safe to assume this will be about the same for all of them. | S( k ) | 2 ≈A e −B/ E .
Here B=( π 2m /ℏ )( Z−2 )2 e 2 is not an adjustable parameter: and plotting ln | S( k ) | 2 against 1/ E for Polonium212 (which emits α ’s with energy 8.95MeV, and lasts 3× 10 −7 seconds) Thorium232 (4.05MeV α ’s, 1.4× 10 10 years), and several intermediate lifetime nuclei gives a straight line plot with the correct slope within a few percent! These elements can all be understood in terms of essentially the same barrier being tunneled through at the different heights corresponding to the α energy. The treatment here is a slightly simplified version of the WKB method, to be discussed in detail later. Further refinements make little difference to the final result in this case. Source: many of the topics covered in this lecture are elementary, and treated in any quantum textbook. For some of them I’ve followed (more or less) the excellent book by French and Taylor, An Introduction to Quantum Physics, Norton, 1978.